The latest Adult Swim series delights in the wonderful everyday experiences that still make life something to celebrate. The title of the show is “Joe Pera Talks With You,” not “Joe Pera Talks To You.” A small distinction, but it’s that tiny little bit of difference that makes the new centerpiece offering in the Adult Swim Sunday night lineup such an endearing, needed bit of comedy. It would be easy to describe Joe Pera’s weekly explanations of the joys of falling asleep or the art of wedding dancing as simple presentations. But the appeal of “Joe Pera Talks With You” is recognizing the traps that the show gleefully leaps over. 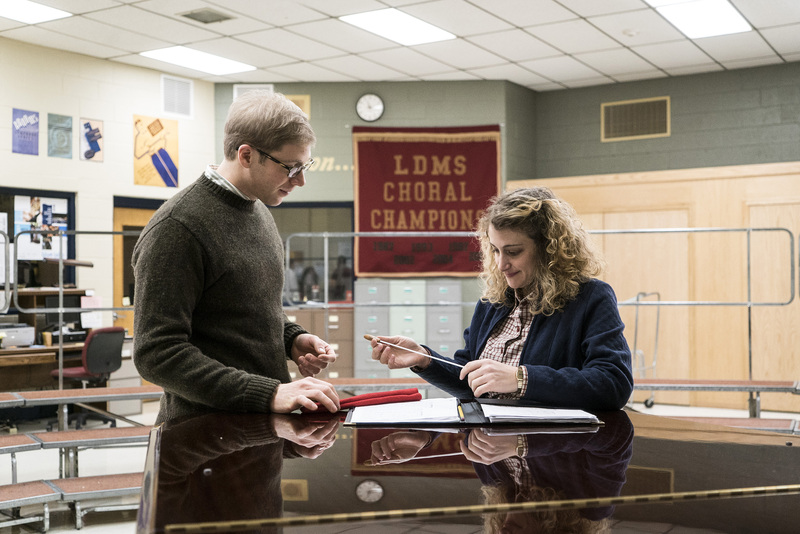 Just as the main character within the show (also named Joe Pera) finds immense comfort in his job as a choir teacher or in an annual fall tradition, the show radiates that same feeling of warmth for its audience. Adult Swim isn’t exactly known for being a bastion of the earnest sincerity that powers “Joe Pera Talks With You.” It’s a programming block that’s never shied away from challenging TV conventions, but sometimes that unguarded approach to its weekend-capping lineup results in shows that build fanbases and followings on their ability to shock and unsettle. “Joe Pera Talks With You” comes from a different place, taking its cue from its host’s more reserved demeanor. Beyond Pera’s distinct storytelling rhythms, this is a show that recognizes the difference between detail and artifice. Building out the neighborhood beyond Pera’s front door isn’t an exercise in quirks. It’s the kind of show that can make a small conversation from an opening 11-minute episode feel like it’s filling in decades of unseen interactions between two characters. “I hope I’m not remembered at all,” Pera says at one point, part of an ongoing fourth-wall break that rarely seems like a device. Even through the filter of TV writing, that’s still a surprising thing to hear from a title character of a show. What makes this series compelling, even in small chunks, is the idea that Pera’s deflecting the focus away from him and to the things in his life that he finds fascinating. In the process, it becomes a far more inviting show by virtue of looking for something wonderful in the universal. “Joe Pera Talks With You” is also a surprising vote of confidence for solitude. Some of Pera’s most satisfying adventures happen with him by his lonesome and he’s all the better for it. It’s not because of neglect or tragedy; there’s just an inherent appeal the occasional solo adventure that few TV shows have the patience to indulge this much or this well. There’s an added benefit in following Pera’s personality over multiple installments, but there are still some standout episodes from the six that have aired so far. “Joe Pera Shows You How to Dance” goes against some of the expected conventions of a flirty wedding date story. The tiny reaction Pera gives the best man as he walks away is a telling prism for what a viewer brings to the show — it’s a “Wow” that could be mocking in any other circumstance, but he’s genuinely appreciative that something like a wedding can be such a showcase for people’s instincts. This is the kind of show in which the boisterous wedding guests are the “weird” outliers. But even then, the people who are different here get that same amount of wonder as the natural wonders like minerals and breakfast food do. The proof is his congratulations to the happy couple and the endearing way he ends that particular evening. Of course, that’s not to say that the show relies on Pera being a static character as he observes the world around him. This past Sunday night’s “Joe Pera Reads You the Church Announcements” is an episode built around discovery, the kind that’s so invigorating it demands to be shared with others. Some characters might not share that same feeling of inspiration, but the show itself delights in experiencing something for the first time rather than poke fun at one character for being late to the party. This show doesn’t confuse quietness for simplicity, either. Even though Pera’s reserved style isn’t the usual energy level of your standard main comedy character, there’s still a complexity to how these tiny installments stack on each other. The family who mistakenly tours Pera’s house in the show’s premiere comes back for later episodes. Nor is Pera’s in-show best friend Gene just a one-off character meant to set up a memorable final line of the first episode. At the end of “Joe Pera Takes You on a Fall Drive,” when Joe sings a small ditty called “Warm Apple Night,” it’s not waiting to make you laugh by pulling the rug from under your expectations. It’s designed to make you smile based on the idea that the show has gradually aligned your interests with his. Even if you’re not a huge fan of whole milk, there’s something about the quiet confidence that Pera delivers the idea that there are few things more satisfying than hearing/watching it being poured into a glass. So bless this show for affording a central character the chance to have an unmitigated sense of appreciation for being alive. There’s no shortage of reasons to be upset with the way that things are, and justifiably so. But through the eyes of one guy in northern Michigan just making the most of it, we get these tiny rays of optimism. “Joe Pera Talks With You” may not make you laugh. Maybe it’ll open your eyes. “Joe Pera Talks With You” airs Sunday nights at midnight on Adult Swim.